By Juan M. Gonzalez-Calcaneo. Juan is a Jane’s Walk Toronto City Organizer, focused on the festival’s communications. Jane’s Walk is taking place in cities around the world on May 3-5. City walking was not part of my experience growing up in my native Mexico. For the most part, the south of Mexico can be unbearably hot and humid for most of the year, which means that the majority of us jump from indoor environments into air-conditioned vehicles, and back to another indoor environment in an endless loop. Long distances, safety concerns, and urban planning that prioritizes cars over pedestrians were other issues that made the act of walking more challenging than enjoyable. Since my arrival in Canada in the early aughts, I have developed a habit of walking as much as I can, regardless of the weather or distances. Walking is how I got to know every pocket of downtown Toronto, how I met a lot of friends, and how I got to understand the spirit of our city. Today, my walking habits have even become a running joke between members of my large family living abroad. Whenever they visit me, they know to bring the most comfortable shoes they can find since, as they correctly assume, I will force them to walk to the point of exhaustion. In Toronto, I discovered joy in walking. Walking continues to provide a clear-headed space for myself; one in which I can be more present and more engaged with my surroundings. Having the opportunity to be part of the organizing team behind the 2019 edition of Jane’s Walk Toronto has been an impactful an eye-opening experience. I now realize how much of the city I’ve been secluded from and ignorant about. Over the last few months, I’ve met countless people whose love of the city and engagement with their communities have changed my perception of what it means to call yourself a resident of a neighbourhood or city. Most of these folks are extremely active members of their communities, promoting a more participant and engaged kind of social cohesion. 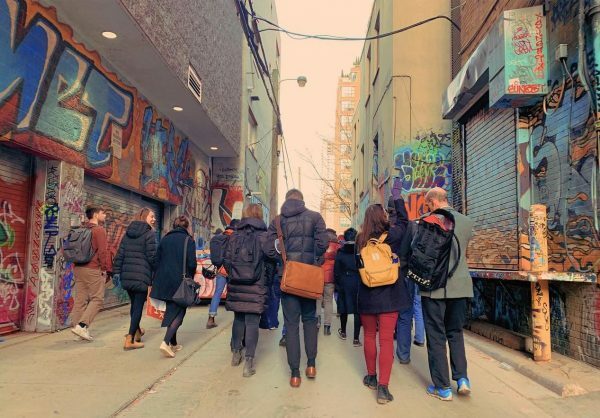 Their interests, initiatives, and concerns are wildly varied—a reminder that everyone’s experience of our city is vastly different, and a concept embodied in the wide array of free, citizen-led walks that will be offered during Jane’s Walk Toronto 2019. To give you a small taste of some of the themes that will be explored this year, I’ve compiled a short list of the walks that have piqued my interest and that I’m looking forward to attending. My interests can be slightly eclectic, but this list offers a balanced mix of my personal interests, which includes LGBTQ+ history, the arts, the weird and esoteric, as well as some areas of the city or topics that I’m clueless about, like plants, Scarborough, and the PATH. As you will notice from the list below, there’s something for everybody at Jane’s Walk Toronto 2019. If you feel like there’s a lack of certain themes, conversations or areas of the city, I invite you to sign up as a walk leader, which you can easily do until May 2nd. Remember, you don’t have to be an expert on anything, simply be willing to open yourself up and share the stories about the places you live, work, and play in. I hope to see you out on the streets the first weekend of May! Friday, May 3rd AND Saturday, May 4th. 11 AM. Led by Auriel Haynes with Malvern Action for Neighbourhood Change. We will discuss the ever-evolving landscape of the area and the importance of protecting the green-spaces and wildlife that still call Malvern home. The walk will end at the Malvern Library. There will be stops at the new skate park, places of worship, local businesses, community hubs and gardens. Friday, May 3rd. 5:30 PM. Led by Geraldine Cahill. Saturday, May 4th. 11 AM. Led by Patrick Burke and Brodie Johnson of the Financial District BIA. Saturday, May 4th. 1 PM. Led by Howard Tam. Come for a fascinating walk around old Agincourt in Scarborough! We’ll explore a place where the 19th century meets modernism and the heart of “Asiancourt” – one of the most diverse communities in Toronto. We’ll touch on early Scarborough settlers, development of a suburb and the lessons of planning & racial tension around the Dragon Centre. We’ll stop to discuss the Agincourt Recreation Centre, its tragic recent fire and what we’d hope to see as it rebuilds. Saturday, May 4th. 2 PM. Led by Parker Kay with the Centre for Experimental Research. There is an oasis at the centre of Toronto. Near Davenport and Christie, Wychwood Park was designed in 1874 to be an artists’ haven. The neighbourhood has many intriguing elements such as the unique presence of Arts and Crafts architecture, suspicious deaths, residents like Marshall McLuhan, and traces of the now hidden Taddle Creek. This walk will not only explore this unique piece of Toronto history but also how it has resisted the pull towards a digital existence. Because of its publicly accessible private land designation, Wychwood Park’s streets escapes the eyes of Google Maps and have developed an augmented allure due to an emerging term: Internet Mysticism. Jane’s Walk Toronto 2019 will take place city-wide from May 3-5, 2019.